If you’ve never experienced the innovative digital library from ArtScroll, here’s your chance! ArtScroll’s app for Apple, Android and now Kindle, is the revolutionary way to learn in today’s world. Putting the clarity of the Schottenstein Gemarah at your fingertips, the ArtScroll app adds convenience, plus all kinds of innovative features such as search functions, color coding and highlighting capabilities, and note functions. You can also tap on a reference, and the source commentary will instantly pop up. Want to try it for yourself? Here’s your chance. ArtScroll is offering a free volume. The 10th chapter of pesachim talks about the Seder, the Four Cups, the Ma Nishtana and recounting the story. It is an excellent selection to prepare for the seder. First, you’ll need to install the app, available through the Apple App Store, Google Play Store, or the Kindle App Store. 2) Click this link to visit to the volume’s product page on ArtScroll.Com. 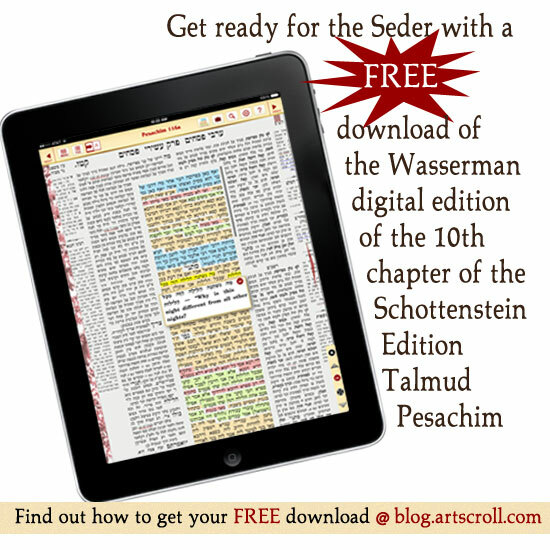 Click on this icon (pictured at the right) and it will take you to the correct volume in the ArtScroll App. Click “download” to save it to your library. 3) Open the ArtScroll app, then open the in-app store. Click on the “individual volume” section and scroll down until you see the option for Pesachim 3 FREE Sample and click download. To learn more about the Wasserman Digital Initiative App, click here to read more or watch the video.